The people of the kali yuga are prone to quarrel. They possess limited intelligence and short lives. Due to their limited intelligence, the majority of people live in the darkness of ignorance but think that they, themselves, are very intelligent. They think that they have a lot of wealth and that they have got everything under control. However, these people never contemplate the main goal that is to be achieved having been given this rare form of human life. They do not realize that despite earning so much wealth and property, they will not be able to take anything with them after death. Unlike real human beings, they cheat other people and instill fear in them; they sit in high government positions and show off their higher power to the general public instead of serving the common people. They do not follow their prescribed duties, rather accept bribes for the work that they are actually responsible for doing. In addition, they collect huge salaries from the government at the end of each month. However, they never think, “What is the actual purpose of collecting so much money and wealth?” They fail to realize that after death, their family members will either take their bodies to the cremation ground and burn them or will take their bodies to the burial ground and bury. The body will inevitably be destroyed in either case. The true identity of the living entity is not the body. In reality, all living entities are spirit souls (ätmä). The soul is eternal and ageless; it is like an extremely miniscule spark of fire which is part and parcel of the Supreme Lord (bhagavän). A truly intelligent person thinks about achieving auspiciousness for his soul: “All of this cheating work that I have done was to gain lots of wealth for the pleasure of my body. However, I have not done anything for the betterment of my true constitutional position as the soul.” Such intelligent people are an extremely small minority in the kali yuga. Knowing that this would be the case, the Supreme Lord appeared on earth in the form of a devotee in order to personally show the genuine and painless method towards self-realization for the general populace in the kali yuga. One caturyuga or divya-yuga consists of one cycle of satya, tretä, dväpara and kaliyugas. 71 such caturyugas make up one manvantara. 14 manvantaras make up one day of Lord Brahma. 533 years ago, in the 28thkaliyuga of the 7thmanvantara, the Supreme Lord, Himself, appeared as Sri Krishna Chaitanya Mahaprabhu. He took on the form of a renounced person which is the fourth order life in Vedic society (sannyäsa) and showed the facile path towards God-realization for the kali yuga known as the sacrifice of the congregational chanting of the Holy Names (saìkértana-yajïa). Sri Krishna Chaitanya Mahaprabhu taught that saìkértana is the only method for the kali yuga. The word saìkértana refers to quietly chanting the Hare Krishna Mahämantrawith a one-pointed heart and also refers to loudly singing the Hare Krishna Mahämantra together with other devotees in a group. 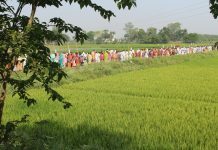 As aresult of the Supreme Lord Sri Krishna Chaitanya Mahaprabhu’s teachings, today, the preaching and distribution of the Hare Krishna Mahämantra is seen in more or less, every town and village of the world. The Supreme Lord has said that it is not possible for the people in the kali yuga to be engaged in meditation. The people of this age depend on grains for maintaining their lives and their minds are dedicated to material sense gratification. Nobody in the kali yuga can continuously sit in one place for even one whole day to worship the Supreme Lord with a one-pointed mind. However, in the satyayuga, people had very long lives lasting 100,000 years. They had unthinkable competence in regards to material sense control. That is why people of the satyayuga would continuously sit in one place, year after year, without eating or drinking anything, completely surrendering their minds to the Supreme Lord, being absorbed in meditation upon Him. We know from the revealed scriptures that Hiranyakasipu continuously stood on one toe of his foot for 10,000 years in meditation in order to gain the boon of immortality from Lord Brahma. The people of the kali yuga do not have life spans of 10,000 years. It is doubtful that people in the kali yuga, within their 100 years of life, can even sit for 10 hours in one place to meditate on the Supreme Lord. That is why Sri Krishna Chaitanya Mahaprabhu taught us to worship the Supreme Lord through chanting and singing the Holy Names rather than to practice meditation. After the satyayuga ended, the tretäyuga began. In the tretäyuga, the path for worshiping the Supreme Lord was through fire sacrifices. A brähmaëa must be completely free from disease in order to perform such fire sacrifices; the brähmaëa must also be free of any material greed and desires for gain. The proper ingredients must also be utilized for the fire sacrifices, namely ghee (clarified butter) and wood. The ghee has to be produced from the milk of a cow who has given birth to a male calf. The wood has to be from teak, mango, wood apple, and kadamba-flower trees. The wood has to already be dried while being present on the trees; one cannot cut the wood and dry it subsequently for use in the fire sacrifices. It is extremely difficult to collect these ingredients in the kali yuga; actually, it is not just difficult to collect these ingredients, but rather, it is basically impossible to collect these ingredients in the kali yuga. We certainly engage in fire sacrifices nowadays but we do not see horses and sweet rice coming out of the fire sacrifices as they used to, during the tretäyuga when sages like Visvamitra and Vasishtha performed fire sacrifices. Nowadays, we see nothing but some smoke is produced from fire sacrifices. These days, there is nothing more than reciting some mantras and burning some ghee. 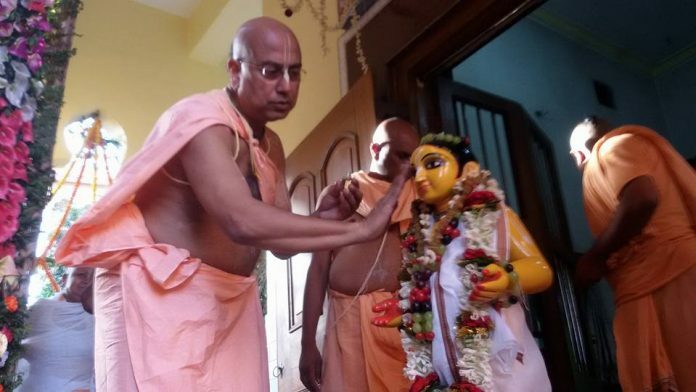 This is why Sri Krishna Chaitanya Mahaprabhu taught us the easiest method of congregational chanting of the Holy Names (näma–saìkértana) for the kali yuga. The dväparayugabegan after the end of the tretäyuga. 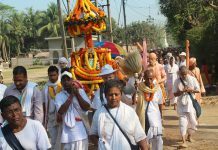 The method of worshiping the Supreme Lord in the dväparayuga was through deity worship (puja-arcana). However, as stated earlier, puja requires a brähmaëa who is free of disease, free of material greed and free of desires for gain. It is impossible to find such a brähmaëa in the kali yuga. In the dväparayuga, Arjuna, who was the beholder of the gändiva bow, obtained the päsupata arrow by worshiping (püja) Lord Siva. Dronacarya, Parasurama and various brähmaëas obtained many weapons from the higher living entities (devatas) through the purity of their worship. However, nowadays, the worship of higher living entities (devas anddevés) has become a business for obtaining higher levels of material sense enjoyment and sense gratification. It has become a business for having one’s lusty material desires fulfilled. The real goal of worship is to worship the devata and devé through one’s love and service, thereby, satisfying them. When the devas and devésare pleased with us, they bestow auspiciousness upon us. Nowadays, such higher purpose for worshiping the devas and devés has been lost from our minds; instead, on the pretext of worshiping the devas and devés, people are solely looking to fulfill their material sense gratification. The devas and devés are not our servants; they should be our objects of worship. The object of worship of all of the devas and devés is the Supreme Lord, Bhagavän Sri Krishna. The devas and devés are like the branches of the tree whose root is the Supreme Lord, Sri Krishna. When the root of such a tree is watered, all of the branches and twigs will automatically be nourished. In that way, when the Supreme Lord Sri Krishna is pleased with our activities,all of the devas and devés will be automatically worshiped. The eternal spiritual principle for the kali yuga is the congregational chanting of the Holy Names of Sri Krishna – harinämasaìkértana. In order to spread this message, the Supreme Lord, Vrajendranandana Sri Krishna, appears once in the day of Lord Brahma on Earth during the manvantara ruled by Vaivasvata Manu in the 28thcaturyuga. At present, our understanding of our true eternal constitutional function has gone far away from its genuine goal. My grand-spiritual-master, PrabhupadaSrilaBhaktisiddhantaSaraswati Thakur, has spoken in relation to this topic; he said that the true identity of the living entity is that it is the soul and not the material body. The natural, eternal constitutional function of the soul is known as the ätma-dharma. If we try to research about this eternal constitutional function of the soul, then we will find one answer – the eternal constitutional function of the soul is the attainment of eternal bliss (cira-änanda-prapti). If we go deeper, we shall find that the formof that eternal spiritual bliss is Sri Krishna. Attaining Sri Krsna means to attain eternal service to Sri Krishna. Service to Sri Krishna means to give happiness to Krishna through our activities. The Supreme Lord, Vrajendranandana Sri Krishna, appeared in Mayapur, Nadia district, West Bengal 533 years ago. He appeared along with His eternal associates to give eternal bliss to all living entities of the kali yuga through distributing His ownHoly Names through preaching the Hare Krishna Mahämantra. Although He, Himself, is the root of all spirituality, He came to distribute the simple method of self-realization through spreading the chanting of the Hare Krishna Mahämantra. In the kali yuga, no process, such as meditation, fire sacrifices, deity worship etc., can fill our hearts with our eternal nature of relishing eternal bliss other than chanting of Hare Krishna Mahämantra. After the Supreme Lord Vrajendranandana Sri Krishna returned to His eternal spiritual abode at the end of the dväparayuga in the 28thcaturyuga of the manvantara ruled by Vaivasvata Manu, kali yuga entered into this world. Due to being overcome with compassion upon the souls of the kali yuga, the Supreme Lord Vrajendranandana Sri Krishna took up the renounced order of life in the form of Sri Krishna Chaitanya. He preached the Hare Krishna Mahämantra and liberated the living entities of this world from the three-fold burning miseries of material existence. In other words, He showed the path for the living entities to become free of all material attachment and enter into the divine spiritual abode of Goloka Vrindavana which is filled with bliss and peace, the path of devotion (bhakti-dharma). However, the influence of mäya (illusion)in the material world is so strong that the humans, despite being the supreme creation of the material world, still become bewildered by the grapple of illusion. 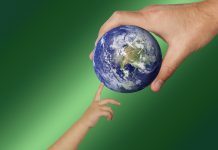 Instead of being liberated from material attachment, the living entity becomes totally attached to matter and takes birth in 8,400,000 species of life, sometimes as aquatics, sometimes as plants, creepers and rocks, sometimes as insects and bugs, sometimes as birds, sometimes as various types of animals and finally,attains the human body. Thus, the soul perpetually wanders in the cycle of material attachment. The congregational chanting and singing of the Holy Names have been described as the divine treasure of the supreme spiritual abode, Goloka. In other words, in Goloka Vrindavana, due to relishing divine love, everyone walks like dancing and everyone speaks like singing. The divine Lord of Goloka, Vrajendranandana Sri Krishna, took on the renounced order of life, appearing as Sri Krishna Chaitanya. Sri Krishna Chaitanya freely distributed that extremely rare supreme wealth of divine love to all living entities; He did this to remove the humans’ tendency of quarreling and to provide them with the opportunity to enter into the blissful, spiritual world. Side by side, through His own behavior, Sri Krishna Chaitanya taught how to surrender unto the Supreme Lord. The main method to be able to relish the taste of the treasure of divine love is through surrender. Surrender means to be humble, be tolerant, be free of desire for material gains, worship, and position, to give appropriate respect to all living entities and to chant and sing the Hare Krishna Mahämantrawhich is the auditory form of divine love (prema-dhana). In this manner, by establishing oneself in these characteristics of surrender, one should inspire others to taste this treasure of divine love. The Supreme Lord, Vrajendranandana Sri Krishna, who took on the name of Sri Krishna Chaitanya, taught us the path of surrender through His own behavior. In JagannathPuri, Sri Krishna Chaitanya, as a 24-year-old sannyäsi, destroyed the pride of His senior, SarvabhaumaBhattacarya, through the symptoms of surrender, despite SarvabhaumaBhattacarya being supremely wise in comparison to all (pandita). Further, Sri Krishna Chaitanya made SarvabhaumaBhattacarya ecstatically blissful through making him taste this näma–saìkértana. Similarly, in Kasi, Sri Krishna Chaitanya transformed Prakasananda Sarasvati’s explanation of formless Mayavada philosophy through the symptoms of surrender; He made Prakasananda Sarasvati ecstatically blissful through making him taste this näma-saìkértana. The deliverance of the world is understood to be the transformation of all materialistic characteristics into enthusiasm for chanting the Holy Names. Everybody will be struck with wonder upon hearing about Jagai and Madhai who are spoken about in the verse above. Jagai and Madhai were not wise scholars. Rather, they had completed every single sin that can be thought of on earth. Sri Krishna Chaitanya, through the symptoms of surrender, even transformed the natures of Jagai and Madhai through making them taste the nectar of chanting and singing the Holy Names. This harinämasaìkértanawill make everyonecrazy in supreme bliss; it will never make people crazy to attain material gains, worship and position. Sri Krishna Chaitanya is the Lord of divine love (prema-purusottama). His process of chanting the Holy Names makes everybody crazy in divine, supreme bliss. We should note that when we chant and sing the Holy Names in a mood of false humility, instead of becoming crazy in divine transcendental love and bliss, we become obsessed with attaining material gains, worship and position. In this way, we will be engaged in fighting with each other in the name of preaching the message of divine love which was taught by Sri Krishna Chaitanya Mahaprabhu; we would thus lose the priceless treasure of divine love and waste our rare human birth. However, every single soul which is embodied in a human body must remember that this kali yuga is very fortunate. We have all taken birth in human bodies in this specific kali yuga because we are extremely fortunate. We must take advantage of this birth. We will gain the full advantage of this birth when we vow to chant and sing the Holy Names through surrendering unto the lotus feet of the spiritual masters and pure devotees. Everyone please, thus commit to chanting and singing the Holy Names and perfect your rare human form of life. भगवान् के दिव्य प्रेम की विशेषता! अर्थ: हरिनाम संकीर्तन, गौलोक का दिव्य प्रेम धन है| फिर क्यूँ इस पवित्र नाम के प्रति मेरी रूचि नहीं उत्पन्न हो रही है?